India is also referred to as the Republic of India. It is a country located in South Asia. With over 1.2 billion people, it accounts for the second largest population in the world. It is the 7th largest country based on land area.India is rich with cultural, natural, and historical wonders. Some would argue that India is a wonder of the world itself with all of the spices and flavors. India has a coastline that stretches 4,700 miles (7,517 km). It is recognized as one of the 17 megadiverse countries and is home to an array of the world’s animal life. The Taj Mahal, which translates “Crown of the Palace,” is a beautiful ivory-white marble mausoleum located on the Yamuna river in Agra, India. The Taj Mahal is one of the Seven Wonders of the World and accordingly India’s number one attraction and the leading wonder for the Seven Wonders of India. 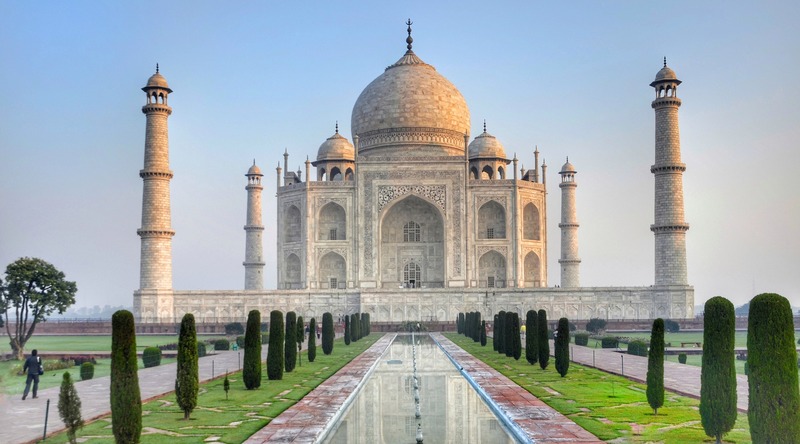 The Taj Mahal was recognized as a UNESCO World Heritage Site in 1983 and as India’s leading attraction, draws 7 to 8 million visitors annually. The Taj Mahal complex is set along a 980 feet (300 m) square Charbagh or Mughal garden. The dome reaches a height of 115 feet (35 m) serving as the leading feature of the building. The minarets set at the four corners of the constructed site with each reaching a height of 130 feet (40 m). The tomb is the central focus of the entire complex constructed for Mumtaz Mahal, the favorite wife of the Mughal emperor, Shah Jahan.